I was chatting with Nikki today at lunchtime in Rainy Hall and we covered the usual broad range of topics. I’m doing a funeral in a couple of days and I mentioned that I still don’t get the ‘privileged’ thing that many in ministry speak about. We agreed that, for us certainly, it wasn’t the best word to describe how we felt about funerals. I don’t mean to suggest that we didn’t like doing them, but that there were problems with the word itself. It didn’t seem to capture the ‘motivation’ behind doing a funeral. As I was wandering home from the station later, it struck me what my issue with the word is, at least in my eyes. For me, it’s the wrong focus. When we speak about being privileged, the focus is on us, and how we are feeling. It’s almost as though we are getting some sort of reflected blessing from the bereaved. After all, “Blessed are those who mourn.” Maybe we’d like a little piece of blessing too? But, quite frankly, it doesn’t matter a hoot how I feel about a funeral. It doesn’t matter whether I feel any sort of blessing from it at all. It’s not about me in any way, shape or form. I could, in theory, walk away from it utterly untouched and unconcerned and still have been a blessing to those who mourn. Because that’s the important bit. My purpose is to be part of the flow of that blessing from God, bringing the sense of comfort the bereaved need. But in a very real sense I am not even needed for that, but I’m there. And I’m there because I am called to be and so I pray for God to use me in any way necessary to bring that blessing of comfort. My only desire is to speak the words of remembrance of the deceased, to show that memories may yet live and still be spoken with pain and gladness, but nevertheless still spoken, and to communicate that there is hope beyond even those memories. But that’s not about me, or at least it shouldn’t be. That’s about giving myself over to my calling; about dying to my own desires and seeking only God’s. That, to me, is only a privilege in the very superficial of senses. I suspect that comes across at terribly self-righteous and even critical of those who take a very humble view of privilege. It’s not my intention to criticise others, but simply to reflect on why I have an issue with the word. so, if anyone’s got a better word, I’m happy to hear it. If you haven’t happened upon it yet, let me recommend at eighty one. Avril writes very movingly and powerfully about her journey alongside her elderly father as he (as they both) come to terms with his vascular dementia. At yesterday’s candidates’ training session (MTN) we were discussing the difficulties faced when visiting elderly people in care homes. It can be easy to forget that the disconnected faces and the disruptive outbursts are only a snapshot of the person here and now. It’s easy to forget that they have a history, a family, a life. We may never get to hear their stories and so may be utterly unaware of their past. And yet that is what we need to hold in mind during a visit. This is where Avril’s writing is both profound and necessary. We become privileged sharers in the story and through that sharing come to see others as having a story which, though we may not share it, we acknowledge it before God by valuing our time spent with them and in our prayers for them. I’ve been working my way through Emerging Churches, a very useful book giving a survey of what Emerging Church is all about. I came across a reflection from Doug Pagitt who sees three ‘types’ of EC and one of them really struck a chord with me. He doesn’t see the church as “necessarily the center (sic) of God’s attentions” and that God is already at work in the world; the church “has the option to join God or not”. But it also throws into question the whole issue of the EC movement. Is it actually necessary to establish churches to do mission work? The answer must be, “no,” but what then is EC for? It seems to me that EC is, in a sense, a by-product of missional work. Or, at least, it can be. It can also be a project in and of itself. Context is the key, I suppose. It also raises some interesting questions for the Church of Scotland, particularly at this cash-strapped time and as it considers its ability to meet its Third Article and be a presence in every part of Scotland. Maybe by trying to be ‘church’ everywhere it will never succeed; but as the missional bringer of the kingdom, that may be a different story. A lot of joined-up thinking required I think. I was at the evening service in my home church last night and, I must confess, didn’t particularly engage with the theme of the sermon. It struck me as bordering on eisegesis rather than exegesis. To be fair, what it was doing was asking questions of the text that weren’t (I would have said) inherent in the text – the questions didn’t arise from the text; they were being imposed upon it (in my opinion). But, as I said, it did kick off a train of thought that I’m still wondering about. 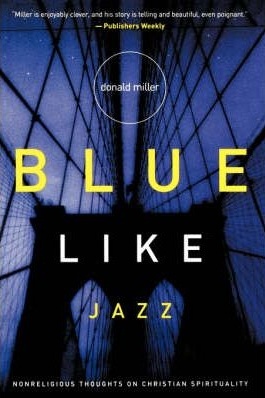 I’ve just finished reading Blue Like Jazz by Donald Miller. It’s one of these books you often find referenced in all sorts of blogs and websites. It also seems to be a ‘love it or hate it’ book depending on which side of the liberal/evangelical divide you sit on (a bit like The Shack, I suppose). But it’s been on my wish list for a while and so I spent some birthday vouchers on a copy. Nelu recently posted a video clip of Rev. Dr. Yvette Flunder on his blog. Go and watch it if you’ve not already seen it. Like Nelu, I can identify with what is being said; greater knowledge does not bring greater certainty. It merely exposes the vastness of our ignorance. And yet you have that paradox Yvette mentions – a greater sense of being at peace with God, despite our ignorance. I must confess though that I’m still working towards the point of being able to say comfortably, “I don’t know.” I still want to explain or even just guess. After all, I’m the one with a theological education. I should have some answers at least. But all I can really do is point towards something that makes sense to me and allow others to take it or leave it as they are led. And then be at peace with their disagreement if that is where they go. And to feel blessed that I can wrestle with questions and discover even more questions. Will I reach that place on the journey? Will I grow enough to feel so blessed and so at peace? i get glimpses of it; hope that I’m going in the right direction; but I don’t know and that’s ok with me right now. … a time to weep and a time to laugh. It would seem that the task of training for ministry is a serious one – and none would deny it. But it seems that some candidates just don’t take their spiritual formation seriously enough. After all, every task must be an occasion for sombre reflection, for appraising weighty matters and for pondering the very essence of ministry itself. So, when some tasks become the time for laughter then that is surely entirely inappropriate is it not? Surely when there is laughter the task is not being taken seriously; it trivialises the issues; it is disrespectful. Yesterday evening’s workshop session ended up being a bit ‘manic’. The subject – our prejudices – was serious enough. But the task – populate a church plant of 12 people from a list of 20 volunteers – ended up as a source of considerable amusement. The justifications for selecting the old lady with the walking stick over the former beauty queen or the 19-year-old shop assistant over the trade union shop steward became increasingly outrageous. And why not select the pregnant school teacher on the grounds that you’ll get a flying start on a Sunday school class? The very contrived list was intended to throw a light on our potential prejudices as we selected one over another. The question is, did creating humorous scenarios from an already very contrived scenario diminish the teaching points intended to be made? Some would say yes and the task should have been treated with due solemnity for what is a potentially serious issue – prejudice. Yet, through the increasingly exaggerated caricatures, it was clear that we read so much into a very minimalist description. And I would hope that a group of mature and reflective people would be able to see the point in that and to recognise that, if anything, our ‘prejudices’ are even more exposed when they are caricatured. And I would further hope that rather than trivialising the issue, the humour is a way to open up the seriousness of the issue. The caricatures will stick in the mind far more effectively than dry, serious analysis. They will act, I hope, as reminders of how rapidly we put together a fabricated image of someone from the smallest piece of information and how outrageous these fabrications can become. That’s not to say that humour is always the appropriate vehicle for learning. But nor is it to say that those who approach a task ‘seriously’ have a right to suggest that the humourists are trivialising a task. Questions may be asked, but openness to the possibility that humour also works must be allowed. This, I confess, is a thinly-veiled rant about the reaction to a particular session. But I do object to the suggestion that I don’t take my faith and my ministry development seriously enough. In every caricature I questioned my reaction and reflected on whether any innate prejudice was driving my keep/leave decision. I believe that I can do that with maturity and balance, regardless of whether I laugh or remain ‘serious’. If I must remain po-faced in my ministry development then I fear that it will be a time to weep. Yesterday I moved from the apartment I was sharing in Zaventem to one in Brussels city centre. In this one, I have the place to myself so I’m not imposing on others (although I couldn’t have been made more welcome in my first digs) and it gives more space when the family come over on holiday. I should have been really pleased getting ‘my own place’ (and I am), but it was tinged with some sadness when I closed the door on the place as the person who had given me a lift left to head home. In fact, truth be told, I felt lonely. Yes, I’ve been keeping in touch by phone and skype and that helps, but it’s just not the same. Just last week, Andrew (my supervisor) and I were reflecting on ministry being a ‘lonely’ job. We are entrusted with many life stories, cares and concerns, not all of which can be readily shared with a trusted friend. And the problem is, many of them are heavy burdens to bear. Many of them are personally challenging. And many of them strike to the root of our understanding of our faith. Having someone else to share our thoughts and concerns with, even if only at a relatively superficial level, is an enormous benefit. Now, it would be easy to say that God is there to share our burdens with, and I’d never deny that. But we’re made to share with one another as well. Our relationship with God is imperfect and never will be perfect this side of resurrection (word chosen carefully). But then, our relatinships with one another are far from perfect and face the same limitations. But they are what we have and when we don’t have them, we miss them and are so much the poorer for that. I was able to sit in, recently, on a confirmants ‘class’. As it was the last one it was a summary of all that had been done previously and a reminder of the vows that were going to be taken. One of those vows is tha promise to join regularly in corporate worship and Christian fellowship. I was asked for a contribution at this point and spoke about our need for relationship with others. This, surely, is the root of our claim to be made in God’s image. We are made to be in relationship, with God and with each other. The Trinity is the very model of that. On a recent visit, I heard about past broken relationships and others that had had to be reconsidered. So much of how we relate to others affects so much of our life and the lives of others and we can never know the full consequences of what we do. Mind you, if we did, we’d probably want to live in isolation for fear of what might happen. This all sounds a bit gloomy and ‘heavy’ but maybe that’s just the mood I’m in at the moment. But of course there is a positive. Perhaps the single most awesome consequence of Christ’s death and resurrection is that of restoration of relationships. Forget ‘going to heaven’, forget ‘sin being forgiven’. forget ‘the price being paid’ (well, don’t but you get the point). All of these are about removing the obstacles in our relationship with God. Not perfected yet, but certainly the signed, sealed and delivered guarantee for the future. But, even better (in a sense), is the beginning of restoration now – with God and with one another (let’s hear it for inaugurated eschatology). No ‘guilt-trips’ about doing our best for God – after all, look what He’s done for you. Just the ultimate example of love healing the most fractured of relationships and through that, a sense of worth and value and inclusion which can only (surely) result in a response of love, to God and to each and every part of God’s creation which He loves enough to save. So, a glorious promise, intended for the now as much as anything, but, at the moment, highlighting that being alone is not a comfortable place. I’m often prompted to blog when I seem to have the same discussions coming from several sources. Tomorrow’s class reading is about territorial ministry and whether the Church of Scotland can, realistically, continue to call itself the national church. Wrapped up in this is the issue of responsibilities to the parish/community and David has written about the burden of parish funerals. Related to this, I have just finished an essay looking at the church’s response to postmodernism and whether Emerging Church offers an answer. And close on the heels of this was a related discussion on ‘entertainment-driven church’ over at Internetmonk. And Stewart is asking related questions about keeping congregation going.